F is for Functional. When I packed shoes for a recent trip to New Mexico, I took sandals. I knew the temperatures would be hot and that I would be wearing mostly capris and shorts. What I didn't consider was MY STUPID BACK. Two days into traveling, my lower back was on the verge of going out due to sitting too long on the plane, sleeping in an unfamiliar bed, and running around all day in flat sandals. I had to act fast, and made my way to the nearest mall in search of proper footwear. I really, really did not want to stick my already sweltering feet into a pair of warm socks and then encase them in sneakers. I came across these "fit" flops at Macy's. I think it was Macy's. I honestly don't remember. It might have been Dillard's. I don't know! It was some department store that we don't have in Alaska. ANYWAY. FitFlops are marketed as a mini gym workout or something, and are supposedly constructed to tone your leg muscles, which is not why I got them. I paid far too much money for them because I was desperate to prevent my lumbar muscles going into spasm and when I tried on these sandals they actually felt comfortable—cushy, but with arch support. I wore them the rest of my stay in Albuquerque, and they did indeed save my back from going out. I've been wearing them at home, too, just because they're so easy to slide into. They're nothing great to look at, but they sure are a comfy pair of flip-flops. F is for Frivolous. In my youth, I always wore rings on my fingers, but over time I have ahem gained a pound or two and outgrown my beautiful bands of gold and silver. I can't even wear my wedding ring any more, because I had to cut it off when I was pregnant with the twins and my left finger mutated into a swollen Polish sausage. Thank you for that imagery, Kim. You're welcome. With all the fabulous handmade jewelry I kept seeing in Albuquerque, I decided to buy myself a late birthday present. I was originally planning on a chunky turquoise bracelet, but I ended up purchasing this sterling silver and opal ring. I always thought opals were white, but these look bluish. They probably aren't even opals and I got totally ripped off, but I still like this ring. And it fits! F is for Flavia. 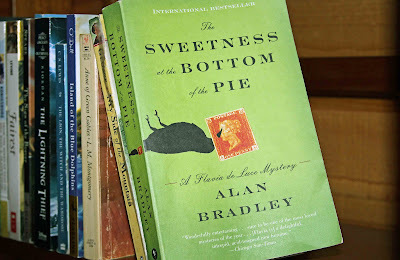 I'm probably the last person in the world to read The Sweetness at the Bottom of the Pie, as it has received all kinds of rave reviews and awards and you've probably already read it ages ago, but I really must recommend this book to mystery literature fans. I say mystery literature, because this book is well-written and character-driven, and might not appeal to those who prefer a quick summer read that's more pulp fiction in flavor. 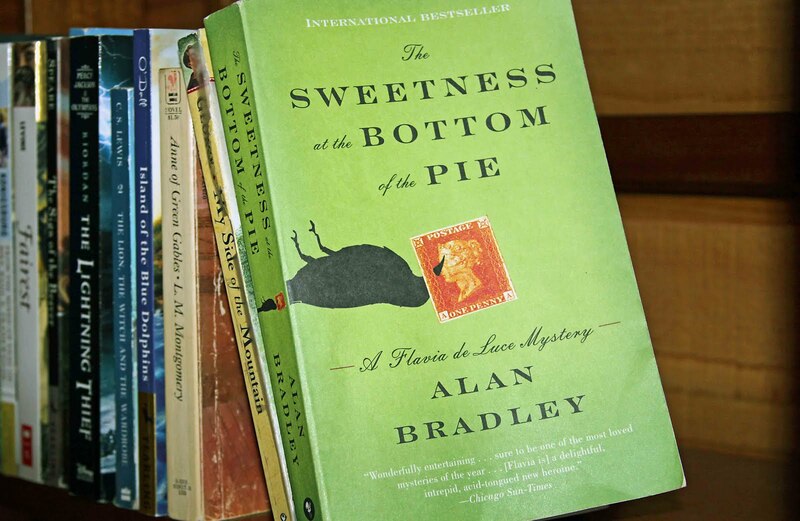 The author, Alan Bradley, is in his 70s and this is his first novel (although he's been writing most of his life—screenplays, short stories, a memoir, etc.) Bravo, Mr. Bradley! The protagonist is a wonderfully precocious 11-year old English girl name Flavia de Luce, and I just love her and her sisters, Ophelia and Daphne. If you took Little Women and threw it in a bag with Anne of Green Gables and a bunch of Agatha Christie novels, shook it up, and poured it out, The Sweetness at the Bottom of the Pie would fall into your hands. Sweetness is supposed to be the first in a series, and I look forward to reading more of Flavia's investigations. F is for Friday. Have a great weekend, everybody! Why Bother With Baby Cribs? I love this post. Very creative. I think I am going to look for those Fit Flops. They look wonderful. You're not the last person to read it because I've never even heard of it! Glad you found comfy sandals even if they were overpriced. That kind of thing can make or break your vacation. I've with Joey...I haven't heard of this book. But you describing it how you did makes me want to. Little Women, Anne of Avonlea, and Agatha Christi? I've just got to read this one. Once I took a pair of really cute wedge sandals on vacation with me, not realizing how much we would walk. By the end of the first day, I couldn't feel my feet, and had to go out and buy new shoes so that I could actually stand up. Wedge sandals and 5 miles of walking: bad combination. At first I thought it said feeling "elfish"!! Those sandals look super comfy! And I love the ring! I might be willing to shell out too much money for comfy sandals. I have plantar fascitis (spelling?!) which makes it impossible for me to wear flip flops or other cheap sandals. Last summer I found a great pair of sandals, but this will likely be the last summer I can wear them because they're wearing out. I'll have to keep an eye out for Fit Flops now when they're likely to be on clearance. I actually meant to say Anne of Green Gables. I guess I just like to say "Avonlea," it's such a pretty word, but that book is when Anne is older and a teacher. Green Gables is what I should have written in the first place, because (like Anne) Flavia is also an 11-year-old spitfire roaming the countryside and getting herself into trouble. 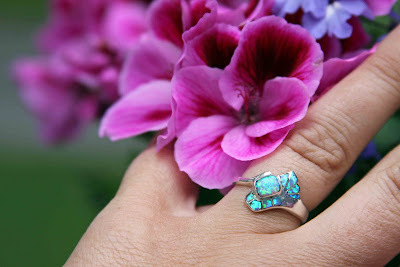 Love the ring - that really is the color of Opal's. There are many varieties od Opal and you choose one of my favorites! I believe the cut is called a "doublet". That ring is gorgeous! Opals come in lots of colors, not just white. And I'm with Joey. I'd never heard of that book either, but I'm adding it to my list! Did You Say EIGHTEEN Pound Carrot?